In this episode we talk about product development with electrical engineer Dave Young, who is an author, educator, and small business owner. Brian has been fortunate enough to be involved in new product development for much of his career. Many firms try to avoid a technology push, in which a novel technology is introduced to the market. However, some authors claim that technology push can be a winning market strategy. An alternate marketing approach, known as “market pull” or “product pull,” is to wait for consumers to request a particular product and allow that demand to “pull” the product into the marketplace. Our guest is Dave Young, who previously joined us on The Engineering Commons for an episode about STEM Education. Dave’s interest in engineering deepened as he tinkered with “X10” home automation modules as a teenager. We learn from Dave why it is always important to turn off one’s soldering iron when suspending work for the evening. Carmen and Dave share a common view on writing code; they would prefer if someone else was doing it! Dave is a co-founder of Blue Stamp Engineering, a summer program which encourages high school students to build projects about which they are truly passionate. Programs are currently active in New York, Houston, San Fransisco and Denver. Our guest is also a frequent contributor of articles to the electronics community known as Element 14. In addition to articles about entrepreneurship, Dave likes to write about Cadsoft Eagle, an electronic design automation program. According to Dave, element 14 is the place to go to ask questions about the credit card-sized computer board known as Raspberry Pi. First-time engineering entrepreneurs often fall into the trap of believing that building a “better mousetrap” will automatically lead to economic success. The term complex sales refers to the process of dealing with the many requirements of selling to a large enterprise. Dave has been running his consulting business, Young Circuit Designs, since 2010. To get product development started, Dave enjoys sitting down with a client and having a “fun conversation,” in which all manner of product ideas are considered, without regard to practicality. Dave will return to the client with a “menu” of between 2 and 10 product concepts that he thinks merit further consideration. It’s hard to guess which ideas will take off in the marketplace; Dave says he would have never guessed that the Snuggie would become a great success. Clients of our guest’s consultancy are located across the United States, and have come from as far away as Nairobi. In Dave’s work, the intellectual property (IP) typically belongs to the client. One of Dave’s clients is BrewJacket, the company bringing the Kickstarter-funded Lager Jacket product to market for home-brewers who can’t keep their lagers cool enough during the fermentation process. The Peltier effect can be used to move heat across an electrified junction of two dissimilar conductors. Carmen expresses his concern over worts being put to waste while testing the Lager Jacket product. Dave has developed a double-kettle brewing system where he and a friend can boil worts at the same time. Carmen is thinking about one day entering a beer recipe in an annual contest held by the Raleigh Brewing Company. Dave recently posted an article about making custom Arduino boards. Dave can be reached on the web at Blue Stamp Engineering and Young Circuit Designs. He posts on Twitter as @DaveYoungEE and @BlueStampEng. Additionally, there is a Facebook page for Blue Stamp Engineering. 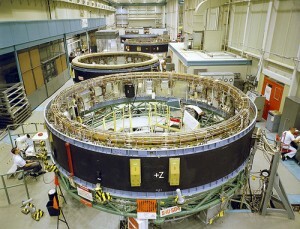 Thanks to NASA’s Marshall Space Flight Center for the photo titled “Manufacturing the Saturn V Instrument Unit (Archive: NASA, Marshall).” Podcast theme music provided by Paul Stevenson.